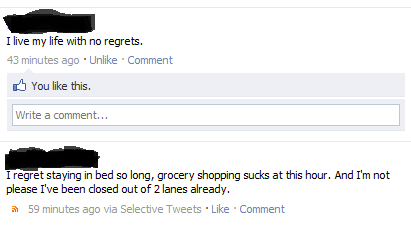 When I got home Sunday evening, I saw this on my facebook feed. I’ve been witness to plenty of online passive aggressive behavior, but I can assure you that these two friends of mine are not friends of each other and would have no reason in the world to lob passive aggressive stuff. I just thought I’d share the irony with you. HAHA. For the record, I only regretted staying in bed so long BECAUSE the grocery store was full of people and I was losing patience. In reality, I don’t know that I have any actual regrets in life. Aha, I was totally rocking out to one of my favorite songs.